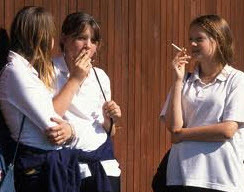 Peer pressure can lead to good teens making bad choices. This is very common. Teen peer pressure can be extremely damaging to a pre-teen or teen who is desperately trying to fit in somewhere –anywhere– amongst kids their age. They are not sure which group they belong in, and those who are suffering with low self esteem can end up fitting more comfortably with less than desirable peers. This can be the beginning of a downward spiral. When a child doesn’t have confidence in who they are or where they belong, it can lead to the place that is easiest to fit in. Sometimes that is not with the best crowd. Keeping your child involved in extracurricular activities such as sports, music, and clubs can help give them a place to belong. P.U.R.E.™ always encourages parents to find the one thing that truly interests their child, whether it is a musical instrument, swimming, golf, diving, dance, chess club, drama, etc. It is important to find out what their interests are and to help them build on these hobbies. Encourage them 100%. They don’t need to be the next Tiger Woods, but they need to enjoy what they are doing and keep busy doing it. Staying busy in a constructive way is always beneficial. Many parents who contact P.U.R.E.™ state that their child has fallen into the wrong crowd and has become a follower rather than a leader. They are making bad choices, even though they know better. However, the fear of not fitting in with their friends sways them to make the wrong decisions. Low self esteem can attribute to this behavior, and if it has escalated to a point of dangerous situations such as legal issues, substance use, gang related activity, etc. it may be time to seek outside help. Remember, don’t be ashamed of this; it is very common today and you are not alone. So many parents believe others will think it is a reflection of their parenting skills; however, with today’s society, the teen peer pressure is stronger than it ever has been. The internet explosion combined with many teens’ entitlement issues have made today’s generation a difficult one to understand. It is so important to find the right fit for your child if you are seeking residential treatment. P.U.R.E.™ always encourages local adolescent counseling prior to any residential treatment programs or boarding schools, although this is not always necessary. Many parents have an instinct when their child is heading the wrong direction. It is an intuition only a parent can detect. If something doesn’t seem right, it usually isn’t. If your gut is talking to you, you may want to listen or investigate what your child is doing. Parents need to understand that teen peer pressure can influence adolescents in negative ways. Do you know who your child’s friends are? P.U.R.E.™ invites you to fill out a free consultation form for more information on finding the appropriate help for your teen.